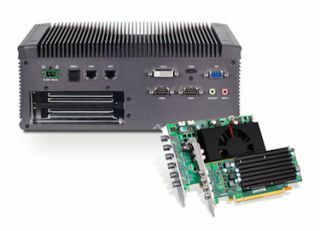 The What: Lanner Electronics has released the LEC-2284, a high-performance box PC powered by Intel's fourth generation Core i7/i5/i3 CPU with QM87 PCH. The What Else: The LEC-2284’s quad-core or dual-core processing power comes from Intel’s Core i7-4700EQ, Core i5-4400E or Core i3-4102E processor. Given its I/O and expansion options, the LEC-2284 is a potential solution for digital signage. In terms of storage and expansion, the LEC-2284 offers dual 2.5" HDD/SSD drive bays and one mSATA socket; expansion is made possible via the included PCI, PCI Express x8 and mini-PCIe socket with SIM card reader. The LEC-2284's Industrial design, 9 VDC to 30 VDC input range, and -10℃ to 50℃ operating temperature ensure round-the-clock availability. It also includes 16GB DDR3L SODIMM memory, dual COM ports, dual serial ports, dual USB 3.0 ports, four USB 2.0 ports and wall/VESA/rack mounting options. Lanner now offers two video wall solutions incorporating Matrox C-Series multi-display graphics cards. These new systems are designed for HD and 4K digital signage and video walls. Matrox C-Series multi-display graphics cards provide dual-, triple-, quad- and 6-display configurations up to 4K and feature 2GB of on-board memory plus secure mini DisplayPort connectivity. The cards come bundled with Matrox PowerDesk for Windows desktop management software for configuration and control of multi-display setups including stretched or independent desktops, clone mode, pivot, bezel management and edge overlap. The Bottom Line: Available in configurations designed for up to six displays, the LEC-2284 is available with Matrox C420 or C680 in a pre-tested and certified configuration.